Henry P. Schauf was born on 1 June 1850 at Prussia. He was the son of William Schauf and Walburga Harriger. Henry P. Schauf married Caroline Maisch, daughter of Lorenzo Maisch and Maria Eva Reuschlein, circa 1871. Henry P. Schauf died on 18 March 1913 at age 62. Henry was the son of William Schauf (1822-1886) and Walburga Harriger (1826-1889) who migrated from Germany (near Cologne in the Rhineland, at the time ruled by Prussia) to the United States in June,1857 (aboard the sailing ship "Albert Gallatin") settling in the area of Keyesville Ridge, Wisconsin. Henry was the third child of eight and the oldest son. Henry P. Schauf immigrated with William Schauf and Walburga Harriger in 1857. [S247] U.S. Federal Census 1870 U.S. Federal Census, by Ancestry.com, Page 19. Dwelling 138. [S246] U.S. Federal Census 1880 U.S. Federal Census, by Ancestry.com, NA Film Number T9-1445 Page Number 52A. [S244] U.S. Federal Census 1910 U.S. Federal Census, by Ancestry.com, ED97. Dwelling 125. Martha Schauf was born circa 1856 at Prussia. She was the daughter of William Schauf and Walburga Harriger. Martha Schauf immigrated with William Schauf and Walburga Harriger in 1857. John Joseph Honer was born on 9 March 1861 at Wisconsin. He was the son of Moritz Honer Sr. and Adelheid Paffenrath. John Joseph Honer married Anna C. Schauf, daughter of William Schauf and Walburga Harriger, on 11 January 1888. John Joseph Honer died on 12 October 1947 at age 86. In January 1920 Mrs Gustav Schlosser (Blandina Honer) returned from a ten days' visit with her parents, Mr and Mrs John Hohner in Ithaca. [S247] U.S. Federal Census 1870 U.S. Federal Census, by Ancestry.com, Page 2. Dwelling 7. [S246] U.S. Federal Census 1880 U.S. Federal Census, by Ancestry.com, Family History Library Film 1255427 Page Number 273B. [S245] U.S. Federal Census 1900 U.S. Federal Census, by Ancestry.com, ED69. Dwelling 100. [S250] U.S. Federal Census 1930 U.S. Federal Census, by Ancestry.com, ED52-9. Dwelling 61. Married Name circa 1884 As of circa 1884,her married name was Schauf. Christina K. Ruetten was born on 19 November 1860 at Slinsteden, Germany, also reported as Nov 1859. She was the daughter of Hubert Ruetten and Catherine Wilderhutz. Christina K. Ruetten married Michael J. Schauf, son of William Schauf and Walburga Harriger, circa 1884. Christina K. Ruetten died on 29 January 1938 at age 77. Christina K. Ruetten immigrated in 1881. She had 8 with 8 living in 1900 children. [S245] U.S. Federal Census 1900 U.S. Federal Census, by Ancestry.com, ED115. Dwelling 176. [S250] U.S. Federal Census 1930 U.S. Federal Census, by Ancestry.com, ED52-17. Dwelling 344. Name Variation Elizabeth Louise Schauf was also known as Lizzie L.
Married Name 19 August 1919 As of 19 August 1919,her married name was Nondorf. Elizabeth Louise Schauf was born on 13 April 1894 at Wisconsin. She was the daughter of Michael J. Schauf and Christina K. Ruetten. Elizabeth Louise Schauf married Bernard Nondorf, son of Anthony Nondorf and Gertrude Pierick, on 19 August 1919 at Richland Center, Richland, Wisconsin, by Rev. Bernard H McKevitt. Elizabeth Louise Schauf died after February 1974. [S243] U.S. Federal Census 1920 U.S. Federal Census, by Ancestry.com, ED152. Dwelling 10. Name Variation Bernard Nondorf was also known as Benjamin. Name Variation Bernard Nondorf was also known as Ben. Bernard Nondorf was born on 5 February 1894 at Wisconsin. Bernard Nondorf married Elizabeth Louise Schauf, daughter of Michael J. Schauf and Christina K. Ruetten, on 19 August 1919 at Richland Center, Richland, Wisconsin, by Rev. Bernard H McKevitt. Bernard Nondorf died in November 1971 at age 77. Bernard Nondorf obtained US Social Security Card at Wisconsin; last residence Avoca, Iowa, Wisconsin. On 5 June 1917 at World War I Draft Registration, Iowa, Wisconsin. Married Name Her married name was Terness. Bernadine Agnes Nondorf married (?) Terness. Bernadine Agnes Nondorf was born on 6 July 1920 at Wisconsin. She was the daughter of Bernard Nondorf and Elizabeth Louise Schauf. Name Variation Herbert Anthony Nondorf was also known as Herbert J.
Herbert Anthony Nondorf was born on 15 November 1921 at Wisconsin also reported as 15 Nov 1922. He was the son of Bernard Nondorf and Elizabeth Louise Schauf. Herbert Anthony Nondorf married Mildred C. Weidner, daughter of John J. Weidner and Lillian C. Meixelsperger, on 4 May 1968 at Spring Green, Sauk, Wisconsin, also reported as May 5, 1968. Herbert Anthony Nondorf died on 16 February 1974 at age 52. Donald Frederick Nondorf was born on 20 June 1923 at Wisconsin. Donald Frederick Nondorf died on 10 December 1999 at age 76. Michael Nondorf died at died in infancy. He was born in January 1929. John Nondorf died on 23 June 1931. He was born on 23 June 1931. Lester Seely was born circa 1892 at Iowa. He married Hannah W. Johnson, daughter of Jens Johnson and Hannah Bengtsdotter, circa 1914. [S250] U.S. Federal Census 1930 U.S. Federal Census, by Ancestry.com, ED14. Dwelling 103. Joseph Pollock was born circa 1884 at Germany. He married Katherine Margaret Groon, daughter of Gerhart J. Groon and Anna Von Hagel, on 4 February 1914 at Merrill, Iowa. Joseph Pollock died in 1947. [S243] U.S. Federal Census 1920 U.S. Federal Census, by Ancestry.com, ED132. Dwelling 28. [S250] U.S. Federal Census 1930 U.S. Federal Census, by Ancestry.com, ED75-15. Dwelling 63. Married Name Her married name was Koernich. 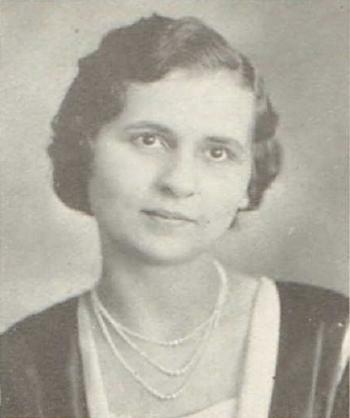 Esther M. Pollock was born circa 1916 at Iowa. She was the daughter of Joseph Pollock and Katherine Margaret Groon. Name Variation Ella A. Pollock was also known as Ellen N.
Married Name Her married name was O'Hara. Ella A. Pollock was born circa 1918 at Iowa. Name Variation Evelyn H. Pollock was also known as Evelin T.
Married Name Her married name was Dreckman. Evelyn H. Pollock was born on 2 January 1920 at Iowa. Evelyn H. Pollock died on 31 August 2002 at age 82. Evelyn H. Pollock obtained US Social Security Card at Iowa; last residence Le Mars, Plymouth, Iowa. Married Name Her married name was Neyens. Lillian M. Pollock married Marvin A. Neyens. Lillian M. Pollock was born on 18 May 1921 at Iowa. Lillian M. Pollock died in April 1985 at age 63. Lillian M. Pollock obtained US Social Security Card at Iowa; last residence Hinton, Plymouth, Iowa. Marvin A. Neyens married Lillian M. Pollock, daughter of Joseph Pollock and Katherine Margaret Groon. Marvin A. Neyens was born on 15 October 1926. He died on 19 July 1995 at age 68. Marvin A. Neyens obtained US Social Security Card at Iowa; last residence Hinton, Plymouth, Iowa. Herman Christopher Nuttbrock Jr. was born on 31 December 1882 at South Dakota also reported as Dec 1883. He was the son of Herman Christopher Nuttbrock and Trientje Aeilts Lutterman. On 12 September 1918 at World War I Draft Registration, Clark, South Dakota, nearest relative Anna Bleeker. [S250] U.S. Federal Census 1930 U.S. Federal Census, by Ancestry.com, ED26. Dwelling 65. Name Variation Carl Funte was also known as Karl. Name Variation Carl Funte was also known as Charles. 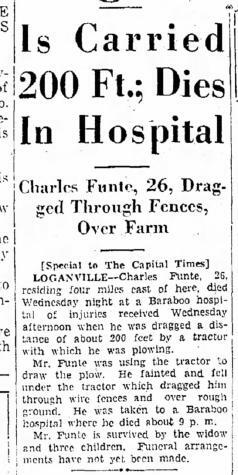 Carl Funte was born on 2 November 1883 at Wisconsin. He was the son of Gustav Adolph Funte and Sophia Littik. 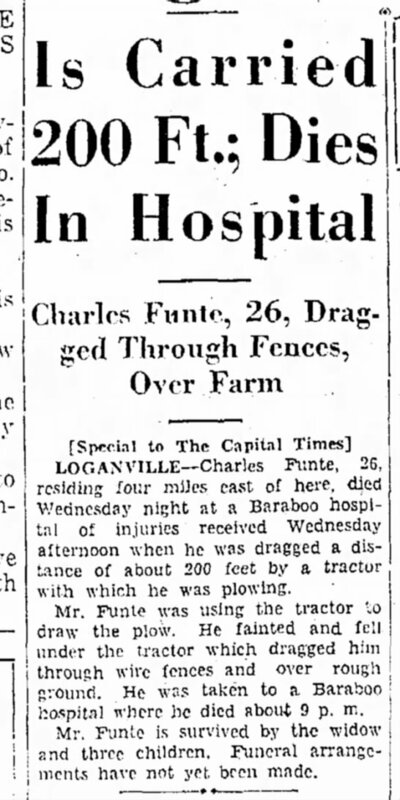 Carl Funte died on 10 September 1930 at age 46. On 12 September 1918 at World War I Draft Registration, Sauk, Wisconsin. On 6 July 1924 at Krey Family Reunion. [S245] U.S. Federal Census 1900 U.S. Federal Census, by Ancestry.com, Year: 1900; Census Place: Westfield, Sauk, Wisconsin; Roll: T623_ 1817; Page: 11A; Enumeration District: 149. [S244] U.S. Federal Census 1910 U.S. Federal Census, by Ancestry.com, Year: 1910; Census Place: Westfield, Sauk, Wisconsin; Roll: T624_1737; Page: 10A; Enumeration District: 0130; Image: 144; FHL Number: 1375750. Name Variation Theresa Krey was also known as Therese. Name Variation Theresa Krey was also known as Theresia. Name Variation Theresa Krey was also known as Teresa. Married Name 26 March 1911 As of 26 March 1911,her married name was Funte. Married Name before 1980 As of before 1980,her married name was Erickson. Theresa Krey was born on 25 February 1889 at Sauk, Wisconsin. Theresa Funte became the godmother at Mildred Louisa Krey's christening on 10 February 1918 at St John Lutheran Church, Reedsburg, Sauk, Wisconsin. Theresa Krey married Roy Erickson before 1980. Theresa Krey died on 28 May 1980 at Sauk, Wisconsin, at age 91. Theresa Krey obtained US Social Security Card at Wisconsin; last residence Reedsburg, Sauk, Wisconsin. On 6 July 1924 at Krey Family Reunion. In July 1940 Mr and Mrs Herman Carl (H. C.) Tilker family visiting with relatives including her brother Laurence Krey and family, and her sister Mrs Theresa Funte. [S245] U.S. Federal Census 1900 U.S. Federal Census, by Ancestry.com, Year: 1900; Census Place: Franklin, Sauk, Wisconsin; Roll: T623_1816; Page: 1B; Enumeration District: 134. Name Variation Syvilla Cecilla Christina Funte was also known as Sevilla. Married Name Her married name was Petersen. Name Variation Syvilla Cecilla Christina Funte was also known as Cevella. Syvilla Cecilla Christina Funte married Bernard Thomas Petersen. Syvilla Cecilla Christina Funte was born on 20 December 1915 at Wisconsin. Syvilla Cecilla Christina Funte died in August 1985 at age 69. Syvilla Cecilla Christina Funte graduated in 1933 at Reedsburg High School, Reedsburg, Sauk, Wisconsin. Harley C. Funte was born on 28 June 1920 at Wisconsin. He was the son of Carl Funte and Theresa Krey. Harley C. Funte married Agnes L. Held on 18 June 1955. Harley C. Funte died on 14 February 2012 at age 91 Harley C. Funte, age 91, of Reedsburg, died on Tuesday, February 14, 2012 in the Reedsburg Area Medical Center. He was born on June 28, 1920 in the Township of Westfield, Sauk County, the son of Carl and Theresa (Krey) Funte. On June 18, 1955, he was married to the former Agnes L. Held. Harley was proud to be the third generation farmer to farm on the Funte homestead. He was a lifelong member of Zion Lutheran Stone Church. Harley enjoyed outdoor life, animals, birds, playing cards and visiting with family friends and neighbors. He also enjoyed spending time with his grandson, Joshua. Survivors include two children: Eunice (David) Johnson, of Waukesha and Loren (Rhoda) Funte, of Loganville; his grandson: Joshua Funte; two step-grandchildren: Christopher and Heather; his special friend: Dorothy Koch, of Reedsburg; nieces and nephews; other relatives and friends. He was preceded in death by his wife, Agnes, on April 6, 2003; his father: Carl; his mother and stepfather: Theresa and Roy Erickson; two sisters: Adela Wollschlager and Syvilla Petersen; and infant twins in December 1956. Funeral services will be conducted at 11:00 A.M. on Saturday, February 18, 2012 at the Zion Lutheran Stone Church, Westfield Township, with Pastor Erich Hartenberger officiating. Interment will be in St. John Lutheran Cemetery in Reedsburg. The family will receive friends from 4:00 P.M. to 8:00 P.M. on Friday at the Hoof Funeral Home in Reedsburg. Memorials to the Zion Lutheran Stone Church would be appreciated. The Hoof Funeral Home is serving the family. Name Variation Margaret Ellen Garvey was also known as Maggie. Married Name 13 October 1897 As of 13 October 1897,her married name was Dorow. Margaret Ellen Garvey was born on 22 December 1870 at Wisconsin also reported as Jan 1874 and 23 Dec 1880. She was the daughter of Francis Garvey and Bridget McCraw. Margaret Ellen Garvey married William M. Dorow, son of Godfried Dorow and Wilhelamina Braun, on 13 October 1897. Margaret Ellen Garvey died on 18 April 1965 at age 94. Name Variation Frank W. Dorow was also known as Francis. Frank W. Dorow married Monica A. Carmody. Frank W. Dorow was born on 23 December 1896 at Wisconsin. He was the son of William M. Dorow and Margaret Ellen Garvey. Frank W. Dorow died on 25 April 1971 at age 74. Name Variation Margaret Cecelia Dorow was also known as Margaurite. Margaret Cecelia Dorow was born on 20 November 1899 at Wisconsin also reported as 20 Nov 1898. She was the daughter of William M. Dorow and Margaret Ellen Garvey. Margaret Cecelia Dorow died on 20 August 1920 at age 20. Albert Gluth was born on 18 June 1884 at Wisconsin. He was the son of Julius Gluth and Caroline Abraham. Albert Gluth married Lillian Hennings, daughter of Henry Hennings and unknown (? ), on 24 May 1911. Albert Gluth died on 12 April 1977 at age 92 Albert Gluth, 92, Loganville died April 12, 1977 at the Reedsburg Memorial Hospital. He was born June 18, 1884 in Sauk County to Julius and Caroline (nee Abraham) Gluth. He married Lillian Hennings on May 24, 1911 and was a farmer in the Loganville area most of his life. He retired and moved to the village in 1946. Services were held at St. Peter's Lutheran Church in Loganville on Saturday, April 16 with Rev. C. Dale Harrison officiating. Burial was at St. Peter's Cemetery in Loganville with arrangements by Gant Funeral Home. He is survived by his wife, Lillian of Loganville. Taken from the Reedsburg Paper. [S245] U.S. Federal Census 1900 U.S. Federal Census, by Ancestry.com, ED149. Dwelling 192. Married Name circa 1886 As of circa 1886,her married name was Kane. Julia Moore was born in May 1858 at Pennsylvania. She was the daughter of James Moore and Mary (?). Julia Moore married Henry Kane, son of Henry Kane and Mary McCollon, circa 1886. Julia Moore died before 1930. Julia Moore had 4 with 4 living in 1910 children. [S247] U.S. Federal Census 1870 U.S. Federal Census, by Ancestry.com, Page 2. Dwelling 8. [S245] U.S. Federal Census 1900 U.S. Federal Census, by Ancestry.com, ED58. Dwelling 189. [S244] U.S. Federal Census 1910 U.S. Federal Census, by Ancestry.com, ED51. Dwelling 115. [S243] U.S. Federal Census 1920 U.S. Federal Census, by Ancestry.com, ED152. Dwelling 18. 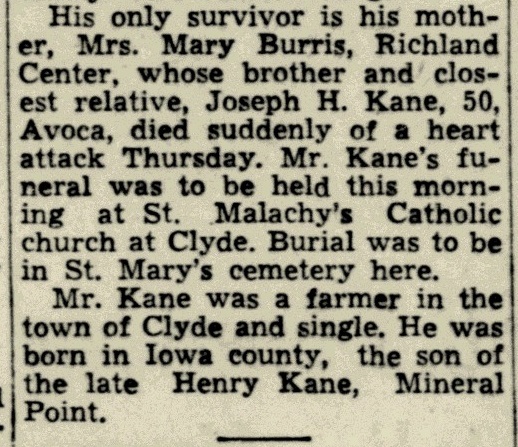 Name Variation Joseph Henry Kane was also known as Joe. 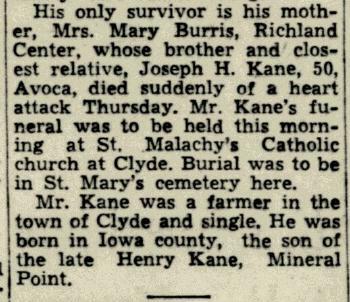 Joseph Henry Kane was never married. He was born on 21 September 1896 at Clyde, Iowa, Wisconsin. He was the son of Henry Kane and Julia Moore. Joseph Henry Kane died on 9 December 1948 at Wisconsin at age 52 Joseph H Kane obituary. [S250] U.S. Federal Census 1930 U.S. Federal Census, by Ancestry.com, ED25-6. Dwelling 66. Name Variation Frank P. Aspel was also known as Francis P.
Frank P. Aspel was born on 14 August 1886 at Wisconsin. He was the son of James Aspel and Gertrude Kessenich. Frank P. Aspel died on 2 March 1953 at age 66. Sgt Medical Department - World War I. [S243] U.S. Federal Census 1920 U.S. Federal Census, by Ancestry.com, ED201. Dwelling 179.